This easy, warm noodle dish makes a great vegetarian weeknight meal. Earthy vegetables are packed with flavor and nutrition, and the white wine helps soften the chard while also creating a savory sauce for the vegetables and noodles. It’s a simple, fresh, and flavorful dinner that’s ready in less than 20 minutes, including prep time. 1. Heat a skillet over medium heat and add the olive oil. Add the bell pepper and onion and season with salt and pepper. Cook until the vegetables have softened and begin to char, about 3 minutes. 2. Add the mushrooms and cook until they release their liquid and begin to soften, 4-5 minutes. 3. Add the chard and wine and stir until the chard has wilted, 1-2 minutes. 4. Meanwhile, cook the noodles in a pot of boiling, salted water 6-7 minutes. Drain and return to the pot. Toss with butter. 5. Add the noodles to the skillet with the vegetables and toss well to combine. 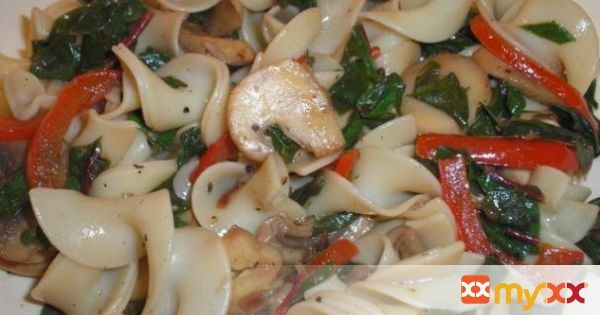 Divide the noodles and vegetables between 2 shallow bowls and drizzle with olive oil. Serve right away.